Great Typhoon summoned the strength of will to defeat their crew-mates, Coursing River, in a pulsating Tideway encounter at the Oxford University Women’s Boat Club Trial Eights. 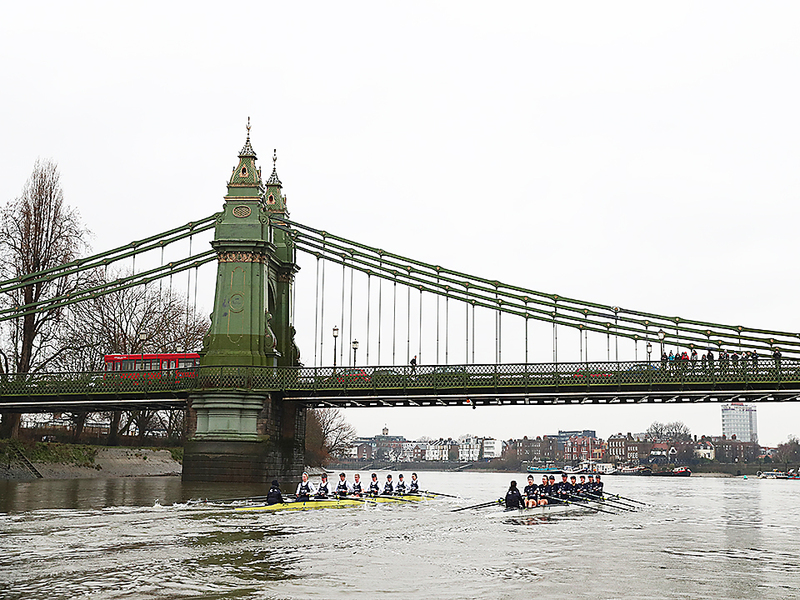 Driving rain and plummeting temperatures did little to discourage either crew, as the race ended with a flat-out sprint to Chiswick Bridge. Coursing River won the toss, choosing the Surrey station to launch their Trial Eights campaign. The crews lined up in downcast conditions on the start line of the championship course under the guidance of umpire Sir Matthew Pinsent. Off the start. Coursing River took an advantage of around two seats before Great Typhoon recovered to draw level passing Barn Elms Boathouse. Short, sharp rhythms seemed to be the order of the day in swirling conditions, as both crews worked their way around the Fulham bend. Stroked by returning Blue Alice Roberts, Great Typhoon made full use of their first bend advantage to draw away from their opponents. The race was beautifully poised approaching Hammersmith Bridge, as Great Typhoon led but the course curved into Coursing River’s favour. Passing St Paul’s School, Coursing River had stretched their rhythm and led by a couple of seats. Despite the best efforts of Pinsent to keep the crews apart, they clashed just ahead of the Chiswick Eyot but the lead remained the same. Rowing around the outside of the Surrey bend, Great Typhoon put in a series of pushes to work their way back to parity before easing out on the start of the second Middlesex bend. It was an impressive manoeuvre, as they took the lead for the second time in the race. Winding up underneath Barnes Bridge, they continued to move away as Coursing River, who were steered by Blue Eleanor Shearer, could do little to halt their charge. That push decided the outcome of the race as a late rally from Coursing River was not enough to stop Great Typhoon from claiming a 1/2 length victory. Amazing to think that just 3 seasons ago the students at @SHHSHammersmith had never been in a rowing boat. Today they’re prepping for a great summer of racing!